Advocates remain optimistic that the city's automated speed enforcement program will be renewed and expanded in this year's legislative session. Budget negotiations concluded in Albany at the end of last week without including an expansion of New York City’s automated speed enforcement program. Advocates are now preparing to campaign for more speed cameras in the spring legislative session. While the Assembly’s budget proposal would have roughly doubled the size of the speed camera program from 140 locations to 290, the State Senate had no such provision. In final negotiations between the two chambers, the Senate majority — an alliance of Republicans, the renegade Independent Democratic Conference, and Brooklyn’s Simcha Felder — did not let the speed camera language into the budget. School speed cameras have reduced speeding by 63 percent at the locations where they’ve been installed, and their use has coincided with a significant drop in pedestrian fatalities in New York City. But the program is severely limited. State law permits cameras to operate at just 140 school locations, which are defined as streets abutting a school entrance, and only during school hours. Until Albany loosens these restrictions, speed cameras will only produce a fraction of the safety gains they could: 85 percent of traffic deaths and severe injuries happen at times or locations when camera enforcement isn’t allowed. The last time Albany allowed more speed cameras was 2014. For the last three years, Families for Safe Streets, Transportation Alternatives, and the de Blasio administration have pushed legislators to expand the program. This year, there’s an added wrinkle: The program will expire at the end of 2018 unless Albany renews it. The Assembly’s budget included legislation known as the Every School Speed Camera Act, which would increased the number of school locations to 290, removed some of the restrictions on where and when cameras can operate, and extended the program through 2021. Politico reported last week that Felder was again an obstacle to expanding the speed camera program in the budget. Felder blocked the same legislation last year after the de Blasio administration refused to agree to his demand to station armed police in every city school. Despite the setback in budget negotiations, advocates remain optimistic that Albany will act before the end of the session. Does this paragraph have an end? Now contrast that Dutch neighborhood street above, with this neighborhood street in Park Slope, 8th avenue in particular. You’ve got density in both locations. But in Park Slope, you’ve got a race course. And look at how wide that street is! 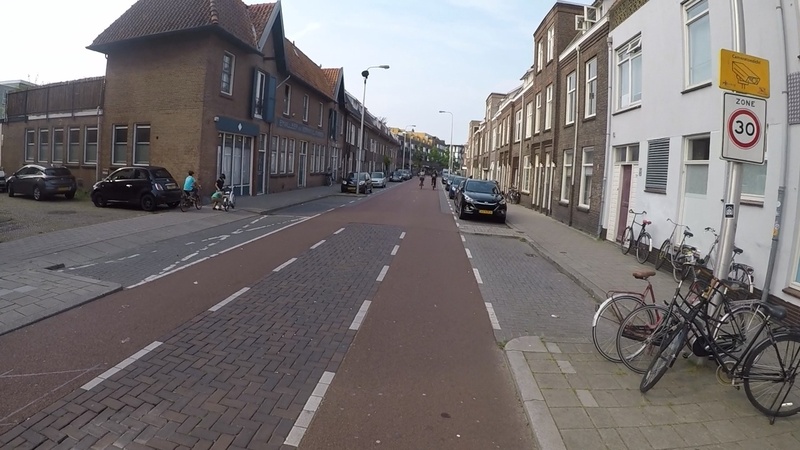 We could still move cars and yet also have a fully protected and 8-80 bike infrastructure. Now, I’d concede we don’t need such bike infrastructure on 8th ave here since one avenue away is PPW. While I have written my legislator, senator and councilwoman asking for specific implementations of red light and speed cameras in front of my child’s school. First and foremost these electronics and street redesigns are fundamentally expensive compensation for the failures of NYPD as a organization. Getting officers to stand at a school intersection during walk to school hours is an apparent impossibility. 1. Keep the school hours restrictions. In most suburbs you have ‘school zones’ with hourly speed restrictions that are almost universally obeyed by motorists, even without cops or cameras present. 2. 1st speeding ticket in a calendar year is a freebie warning, 2nd is the normal fine we have now, the next one is double that, and so forth. People make mistakes sometimes, but if you look at that list of all camera violations by license plate that was linked in previous posts, it’s pretty startling, you have cars that have no violations, or perhaps one in a calendar year, and then you have cars that have like 15 each year, with very few in between. Everyone can make a mistake once a year or so, but there’s no excuse for repeat offenses. I feel this is a good compromise. I live in a Senate district represented by one of the main line (non renegade) Democrats. What can I as an individual do to help get rid of this faction of renegade Democrats that gives control of the State Senate to Republicans? Why is this even happening in the first place? In Munich they ‘blitz’ when you are 10% above the limit. One thing is to get out the message that Simcha Felder is a republican. Why he is allowed to run on the democratic ticket continuously is beyond me. In the primary, everyone in his district needs to know he is NOT a Democrat. He gets the orthodox vote because he is from the community, and that won’t change. But many others just vote for him because he is a Democrat and the incumbent. I’m afraid that nothing is going to make everyone happy. There is a direct conflict between those who want streets to be safe for pedestrians and those who believe that motorists should be free to drive however they wish to drive. As for your second proposal – yes, people make mistakes sometimes, but mistakes have consequences, and asking someone to pony up $50 for unnecessarily endangering the lives of pedestrians is not unreasonable. The pedestrian struck and injured or killed by an irresponsible driver doesn’t get a second chance. This sends a far clearer and more consistent message to motorists. It’s far fairer to motorists, who no longer have to guess whether the speed limit is really in effect or not. And, of course, it’s fairer to pedestrians. Let’s stop playing games. Medium answer: If you don’t live in / vote in an elected’s district, if you’re not a constituent, (s)he really doesn’t care about your opinion. You can go fry ice. Long answer (which isn’t nearly as dismissive as the Short and Medium answers): Read and consider applying relevant portions of The Indivisible Guide https://www.indivisible.org/ It’s specific to the US Congress and Senate, but it’s just as applicable to state and local government. It’s politics, right? You know what that means: MONEY. You can donate to the “challenger” ACTUAL Democrats running against the Republicanocrats and you can volunteer for their campaigns. Albany Can Save Lives By Including Speed Cameras in the Budget. Will They? Traffic violence victims and AARP pressed legislative leaders to expand NYC's automated speed enforcement program as budget negotiations conclude. "Your voices are the only thing that will change the status quo in Albany right now," Mayor de Blasio told Families for Safe Streets at a rally this afternoon. The State Senate adjourned its 2017 session last night without taking action on a bill to expand the use of speed cameras near schools.